First. A Friday visit to former (AOCC) Outlaw gone rouge, Dan, K7IA's base camp hideout just a couple miles due east of my station located just enough inside Arizona from the badlands of New Mexico state line to be eligible in the 7QP. I assisted him and his wife, Erin, in placing a 15 meter Moxon in the pines.....My visit really was to loan him a cordless drill, but that's another story. I would have gone to visit him either way. As always, Dan set's up a well thought out plan and it is obvious this is not his first shootout. More on him in a moment. Friends. Aside from the K7IA eyeball, it was nice to run into my friend KX9T who now lives in Oregon. Bob, K9SV in Washington was another fellow transplanted Midwesterner I had the pleasure to have a brief fire side chat with as this Outlaw got off the trail to sit a-spell'. Freaky. I managed to work NM5WB in New Mexico on 20 meters who was about 120 miles east. A couple other close stations such as N7AKC north of Tucson and another I can't recall at this moment, also made it into my 20 meter log. Weird when the two states that normally don't get in until the evening hours on 40 meters made it in early and on 20 to boot. Fire. I guess about 0230 GMT, I left 15 meters to wander up to 10 to a handful of S&P. Now for the past 30 minutes or so, I recall hearing and feeling "aircraft", as in many, not "an" aircraft, but aircraft in the plural sense. Even with my headphones on and tuned out to the rest of the world, I knew something was up other than airplanes. I stepped out onto the deck to find "Tanker Zero Seven", a DC-9, about 500' above the cabin! I could hear other "heavies" and a light fixed wing (air tac supervisor) and rotor too in the general airspace surrounding my immediate vicinity. Being a firefighter and participating in several of these shows in my time with the FD, I knew this was not normal. So I headed back into the cabin and turned on the scanner. It did not take more than 5 seconds for it to stop on a 118 MHz AM frequency that was being used as an air-to-air tac channel...just going on with all kinds of chatter. I listened to all the tactical communications with interest for about 20 minutes as I was trying to get a handle on where this thing may be exactly. I determined that it was south and west of me and with no strong winds, not a real threat as they talked about laying it down in a steep drainage and a hotshot crew was going to tie in on one of the slury drops as an anchor point to cut this thing off. Even though I did not see or smell smoke, it threw me a bit off pace trying to listen to the scanner, work a contest and also think about possible evacuation plans (note, we have a heightened sense in the Alpine area since the Wallow Fire of 2011). But I forged along with some cautious trepidation with one earphone off the side of my head listening to the air-tac show on one ear, and the HF radio on the other. Needless to say, I lost my appetite for a 10 meter run. This fire, by the way, drove Dan from his digs I later found out, thus squashing his chances at a good effort to win (again) his category. I am sure he will outline this in greater detail in his 3830 report as well, so check it out. Feuds. On-air "misunderstandings" sometimes plague an otherwie good 100 Q per hour run on a frequency. Not the type you think -- "all contesters are jerks" comments, "too close to my frequency" or "a net is about to start here in 10 minutes". No, this one was on correcting MY exchange! Some W6 station indicated to me that I was incorrectly exchanging Apache County as AZAPH but instead should be AZAPA! What?! I began to laugh as I realized that he was serious. He indicated that he was "looking at the rules and it specifically states that it is the state followed by the first three letters of the county spelling". I proceeded to tell him that is not correct and I too had a laminated sheet right in front of me that has all the 7th area states and their associated counties and abbreviations and it pretty much says otherwise. "You really mean to tell me that after five years, nearly 5000 combined QSO's and four consecutive category plaques", as I exclaimed with a smattering of laughter, "I have been sending the wrong exchange?!?!" He said, "Well, maybe you have been" ! I said put AZAPA in your log if you wish, but I am sending you AZAPH and that is what I will continue to send, right or wrong, for the remainder of the contest. If 7QP rejects my 1000 some-odd Q's because of an incorrect county code, so be it I guess! We were not mad at each other, just persistant and stern. Oh well. Findings. Conditions were good especially on 15 and 40, so I deliberately spent some time on these two bands. Great DX was calling (not normal in a domestic contest) on 15 meters and was suprised how much DX actually found me and tossed in their call. Normally, Delaware is either the last state to pick-up OR it is the one that completly escapes the log, but alas, I worked DE early and often; like three or four times in fact. At 11:50 hours into the contest, I grabbed my 50-state sweep with Alaska. This is the first time, I believe, that I swept all 50 in under 12 hours. I took about 20 minutes out for chow. Finally. So between the fire and dinner, I lost some time and footing, hence I would have certainly had a few more Q's in my saddle bag. I shut it down at 1150 my local with 10 minutes to spare and drank a well deserved beer, well, two actually. I believe that I have more than 60 multi's as well; I'm thinking that I have closer to 70, maybe more (? ), but I don't think that Genlog counted correctly. We will see in due time as the guys at 7QP ride the pony express and produce results even before the ink drys, unlike other domestic contests that take nearly a year to produce. It's the only contest in the year that I will participate in representing my county as the exchange. Thanks to the CODXC for a wonderful time that I look forward to year after year. You make it fun with your management and communication and clearly born from real contesters. Contesting is like a microcosm of life packed into a single weekend, is it not? With less than 13 hours, QRP, and a wire antenna. Great fun, made possible, with a big smile for all the friends that came by, and my spouse who helped with a great supper too. And my 2nd harmonic by watching, being a cheerleader, and great encouragement, and not slowing me down at all. It was the first time I have worked the 7QP so really didn't know what to expect. I had a ball! Set up field day style about 30 miles west of Klamath Falls. A great day -- ran single op, low power, and mixed mode. First time trying to work all three QSO parties, what fun! Just can't understand why I didn't find any Idaho stations. Thanks to all the great ops in 1, 7, & 9 land! I finally figured out a method to log 7QP Q's while operating in the Indiana QP. You guys seem to have a bunch of friendly operators and next year I will try to participate much more in 7QP. This was fun! Don't know how this is going to work out on the sponsor side, but working all 3 QP's at once was a blast! Never done this "3 in 1" QP's before, the N1MM IN7QPNE module worked great though. This was an unabashed success compared to last year when Murphy went for the jugular. This year I had a friend help out, and learn a bit and get more operating experience. For the Lake-Klamath border, I spent a fair amount of time researching places that were reasonably easily accessible, had trees available, and weren't in a valley. This location has all three and was my second year in this particular location. There are plenty of 100'+ Ponderosa Pines in the area, testing the limits of my slingshot. In the end, our antenna setup was amazingly simple. A simple 40m dipole with a 20m fan element served for 40/20/15, and we had it up at 55'. With the suggestion of K4XU/N7XU, a switch box was cobbled together to switch the shield to center at the "feed point" at eye level, and then some roughly measured radials added to give us reasonably decent 80m capability. For 10m, a carbon fiber fishing pole Moxon did quite nicely mounted on a DK9SQ carbon fiber mast at about 30'. N1MM performed nicely as usual. It also helps having ferrites on all the cables which has been the #1 source for problems with this particular computer. A new processor also allows for the running of fldigi, which as neither one of us knew CW, allowed for a little dabbling in CW. It's not really efficient though, and unreliable for running a frequency, and not really appropriate for a contest when people want to ensure you got their call right. Band conditions were interesting, some very echo-ey multipath on 40m later on, but there were some interesting DX on. In the end, at least seven DX entities checked in (10 including Canada/AK/HI), and I'm quite happy with this years results, especially after things died last year. Next year, my "wish list" includes a simpler tent setup, getting off my duff and learning CW, and an amplifier since there's no power category for county line expeditions. Got a very late start on this one due to family obligations. Not sure I missed much though - propagation on 15 and 10 seemed poor here, with lots of QRN. 20m seemed pretty slow. Things livened up quite a bit once the Sun went down though, and I had good luck on 80 and 40. Spent a fair amount of time fiddling around with the new rig - a KX3, and HR-50 amp. Thanks for the Q's! Kenwood TS-950SD, Heil ProSet with HC-5 element, and a 102 foot G5RV "flat top" up 50 feet running N-S at an elevation of 6,053 feet in Cheyenne, WY. Ten Meters was dead, but still a "personal best" for 7QP. Lots of folks not familar with contest exchange, (ie. non-7 Landers wanted to tell me their county). Had a blast! Thanks to all for the Q's. 14 hrs and 50 minutes "ON" time, and 3 hours and 50 minutes "OFF" time, resulted in 937 contacts. Next year I'll shoot for 1,000 Q's. This year I took Sunday off from work so I could stay late on Saturday night and was DELIGHTED with the activity on 80 meters. Being able to work more OR and WA stations was a real treat for me--more like a party than a contest. Because my '706 was in the shop, W7CQZ loaned me his ProIII, which made operating a snap. Thanks, Dennis. Also my host loaned me a generator (Generac inverter type), but after barely copying my first contact on Saturday morning due to the inverter noise, I borrowed several extension cords and strung about 200 feet of them up the hill to the van. From then on all was quiet, and I had fun. I stayed on the air to the very end! This was my first time participating in the 7QP, and it was great fun. My good friend Joe W5QLF recommended the 7QP and it was worth the time. You will get logs from a few other members of South Texas DX and Contest Club. We're small, but enthusiastic. I worked a new General class Ham - he was sitting watching his Elmer working the 7QP. His Elmer told me a new General Class was there and I said let me make a contact with him so he got on and gave me a sig rpt and told me I was his FIRST HF contact! Also worked a Ham that said "I have not been very active as you are my FIRST contact in 45 YEARS!!!!" This is my favorite contest each year. I've done county expeditions the last four years. I think that all sections in the USA would be wise to combine all of the states that constitute their section, like we do, instead of having individual state QSO parties. I think it would create a better contesting schedule without watering it down so much. My favorite contact was with 10 year old Sam KG7HBY. It is great to see young people involved. Thanks for the QSO, Sam! We operated K7AUO, www.terac.org, in Gilliam county Oregon at the abandoned Condon Air Force Station for the fourth year. We had good weather for set up for a change but there were a few rain showers during tear down. We made around 679 contacts on 15m - 75m. We heard several South American stations on 10m but no one in the contest. We didn't have any serious Murphy problems this year. Equipment included a TS-450, AL811H, EXP14 beam, 75/40 trap dipole, 43' vertical, and the famous tower trailer. Picked up a new county (now I have all in 7th call area) in spite of the limited time I had to operate. 15m seemd to be the band out here. Looks like 7QP had lots of activity. Great fun. I wish more regions would do this. 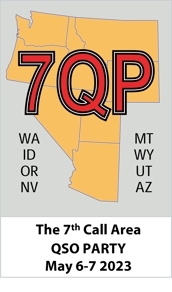 We of the Rogue RF Project borrowed call sign K7LIX in last year's running of 7QP from our killer spot where Oregon's Josephine, Jackson, and Douglas counties meet, and managed to place second overall, thanks to the triple points. The spot is at 5,100' on King Mountain near the town of Wolf Creek. Last year we placed second overall behind the Eastern Arizona Amateur Radio Society, K7EAR, team with 17 operators on the Graham/Greenlee county line in Arizona. But we had word that 2013 was their last 7QP effort, which hopefully leaves the way clear for us! This year we used call sign K7KO. The weather was as good as it gets on King Mountain in early May for assembling antennas on Friday, sunny with just a little wind. We were set up in the same magical three-county spot as last year. Our team assembled on the mountain, and the antennas went up smoothly. We'd acquired some additional equipment for this year. We had two AB-577 military-surplus tubular masts with tribander yagis mounted, complete with triplexers, and also wire antennas for the low bands. We were equipped for four stations this year, two for phone and two for Morse, all equipped with bandpass filters. We're glad to say that we were able to run four stations simultaneously with zero interference problems. 1300Z, or 6:00 AM local time as some people call it, came bright and early on Saturday morning, and after the usual delicious cowboy breakfast from Ron KF7IBN one more logging issue was sorted, and we were off. Scott NA7OM and Ron KF7IBN were on phone, and Allan K7GT and Rob W7GH held down Morse. Contacts flowed steadily into the log. Joe AA7JS cooked up fantastic sausages for dinner. Unfortunately Murphy's Law soon came into play. Our fearless leader Steve K7KO had to drive down the mountain to retrieve some missing equipment, and the engine in his van overheated badly. In the afternoon it was discovered that the two wire antennas for the Morse station both had high SWR, which wouldn't have worked with the bandpass filters, and nothing we did got them to work properly. Joe AA7JS, Steve K7KO, and Rob W7GH worked on the wire antennas for the Morse stations, to no avail. Meanwhile the phone operators kept relentlessly filling the log. The weather took a definite turn for the worse in the evening. It had been drizzling all day, but the wind became ferocious, the rain came down in sheets, and conditions outside were definitely unpleasant. The Morse operators' tent turned out to be inadequate for the job and refused to hold any heat; operating in a 35° F tent wasn't good for running rate. At least contacts continued to be made on 20m Morse, while the phone operators were making hay on 40m SSB. In the evening Rob W7GH, Dan KF7IBL, and Steve K7KO supplemented our tired and hoarse phone operators Ron KF7IBN and Scott NA7OM, who had made contacts all day. We were afraid we'd wake up to snow on Sunday morning, which would have complicated getting down the mountain safely, but luckily we woke to a chilly drizzle instead. We enjoyed excellent support on the mountain. Joe AA7JS could be relied upon for any antenna task, as well as delicious cooking and morale-raising entertainment, when all the operators weren't at the radios that is. Troy W7ACA's help was invaluable for raising wire antennas, and more importantly for helping all the vehicles get down off the mountain on Sunday. Galen KE7LM drove up the mountain on Saturday evening to see how we were doing, slept in his truck, and made sure we took down the two AB-577 military-surplus tubular masts safely on Sunday morning. Wow, what a trooper! I figured out that I had run a Mobile in Salmon Run for over 10 years and 7QP for eight. It has been the same vehicle for at least 10 of those. High power for about five of them. You would think that it would be pretty well running by now. Something always surprises me and gives me “experience”. I was not hearing folks as well as they were hearing me and that should have been a clue. I knew that the sun spot numbers were down and attributed it to that. This years computer was new to me since last years had ceased to function. It took me until late in the day to figure out that the charging system for the computer was an unlicensed transmitter, desensitizing my receiver, in my front seat. I apologize to those who tried to work me in (ORSHE, ORGIL, ORMOR) Sherman, Gilliam and Morrow before I figured it out. This became the cycle of turning on the inverter to keep the computer charged for the CQ cycle and off to listen. I am in the middle of a good run in Morrow and I smell the aroma of hot electronics about to ignite. I send “AS Fire QRT” and investigated. The inverter had other problems also and was heating up. I ran it minimally after that, relying on the computers battery more. When you are sitting on the side of the road in a sparsely populated Oregon county and the need to check Plumbing becomes more urgent, you have limited choices. You could go behind a tree or a bush, but there are not any. The only ones of those are around the farmhouses. Not really accessible to you. The rest of it is cropland, or pasture. I am sure that the folks in the farmhouses are watching the strange pickup with binoculars and I don’t need to give them any more to talk about, so I take a 50 mile round trip to the nearest rest area. All in all it was a good day, helped a gentleman in Sweden with his last three Oregon counties, and all the rest of you that I could finally hear after I figured out my opportunity of this year. The DC-DC supply for that computer was ordered on Monday morning. My buddy, Dave, and I had a great time starting out on the IDTET/WYTET line and working our way through 25 more Idaho counties and two Oregon counties. The full write-up is here. We had a great time in spite of antenna troubles and a learning curve (again) on the N1MM Logger. We were in a fantastic place; not near home in Curry County, Oregon but at the buttonhook tip of Clatsop County with sea water all around us. ID on average is the hardest state to work here in the lower 48, but signals were good during 7QP. I didn't come close to a sweep in any state, but it sure was nice to have N7XU, W7QC, and WW7D all roaming around ID. There was a very noticeable uptick in NV activity as well with many more rare counties active. 10m was only open from here 2315-0130Z when 15m and 20m were both also wide open; signals were booming in from all over 7-land then. Jerry K5YAA put in more miles than I ever could/would be willing to do. He and Alan were still at it around 0500Z! They got "stuck" in Park, WY with roads in Yellowstone closed apparently due to snow, but they eventually made it over to Fremont, ID. Compared to some other QP's the mobile SSB activity was poor (only KO7X from K5YAA heard here), CW was the best ever from here. And county expeditions really made a difference too; I worked several multiple times on both modes.